There's a word for what Arizona is attempting to do here: ethnocide. It is similar to genocide in its scope, but it reflects the notion that it is an ethnic and/or cultural identity under assault more so than physical bodies themselves. "While much condemnation has rightly been expressed toward Arizona's anti-immigrant law, SB 1070, a less-reported and potentially more sinister measure is set to take effect on January 1, 2011. This new law, which was passed by the conservative state legislature at the behest of then-School Superintendent (and now Attorney General-elect) Tom Horne, is designated HB 2281 and is colloquially referred to as a measure to ban ethnic studies programs in the state. As with SB 1070, the implications of this law are problematic, wide-ranging and decidedly hate filled." Whereas SB 1070 focused primarily on the ostensible control of bodies, HB 2281 is predominantly about controlling minds. In this sense, it is the software counterpart of Arizona's race-based politicking, paired with the hardware embodied in SB 1070's "show us your papers" logic of "attrition through enforcement," which has already resulted in tens of thousands of people leaving the state. With HB 2281, the intention is not so much to expel or harass as it is to inculcate a deep-seated, second-class status by denying people the right to explore their own histories and cultures. It is, in effect, about the eradication of ethnic identity among young people in the state's already-floundering school system, which now ranks near the bottom in the nation. Anti-immigrant zeal morphs into bullying as Arizona Gov. Jan Brewer prepares to sign legislation targeting a Mexican-American-studies program in the Tucson Unified School District. It is the employer's job to prove that an employee deserves to be fired – not the union's. If bad teachers are kept on, the real story is management's failure to make its case. Current American education policy is built on these assumptions: The quality of American education has plummeted because our schools are filled with teachers who can't teach. Teachers' unions and contracts tie the hands of school administrators. And teachers' unions protect bad teachers. Here are a few reasons why these conclusions are leading our educational system in a bad direction. First, these policies ignore the effects of poverty on educational outcomes. Given the increasing number of children growing up in poverty, we ignore its effects at our peril. 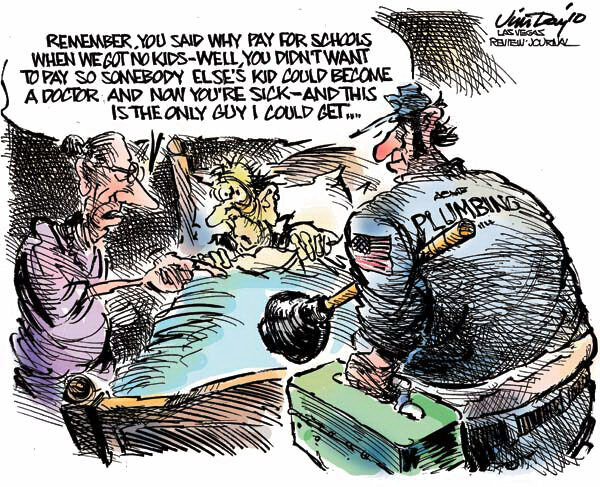 I know something about poverty and its effects because I grew up in an impoverished, single-parent home and attended a low-quality school through eighth grade. Despite those beginnings, I graduated from one of the top US law schools and am now a law professor. If I could make it, then poverty must not matter, right? An overwhelming majority of Americans are frustrated that it's too difficult to get rid of bad teachers, while most also believe that teachers aren't paid enough, a new poll shows. The Associated Press-Stanford University poll found that 78 percent think it should be easier for school administrators to fire poorly performing teachers. Yet overall, the public wants to reward teachers — 57 percent say they are paid too little, with just 7 percent believing they are overpaid and most of the rest saying they're paid about right. Carmen Williams, 53, an office manager from Yates City, Ill., said the issue is simple: Pay teachers more and get rid of the bad ones. The crisis facing students and educators at WCC is not just a local problem. It is symptomatic of a nationwide assault being carried out by the political establishment on public education. It is part and parcel of the efforts to slash spending on social services, health care and all components of the public infrastructure in an effort to drive down the living standards of working people in the interests of big business. Hundreds of Washtenaw Community College (WCC) employees face the imminent privatization of their jobs by the school administration. The move, which will have a devastating impact on the already low-paid WCC workforce, is part of an escalating nationwide attack on teachers’ compensation and working conditions. At the state and national level, political leaders have starved community colleges of funds, with the Obama administration slashing its promised “stimulus” aid for these institutions to a miserly $2 billion in March 2010. In a sign of what is to come at community colleges across the country, WCC has responded by moving to permanently reduce its operating costs, a policy that will likely be repeated at other community colleges throughout the state. David Thies was one of those kids who played school at home. "I'd rope in my grandmother and sister to be my students," he said. 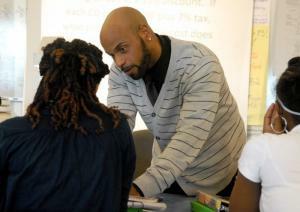 By middle school, he knew he wanted to be a teacher and work with elementary school children. What he did not realize right away was how unusual that would make him. "People would tell me elementary schools needed more male teachers, and I would be in demand," he said. "They were right."